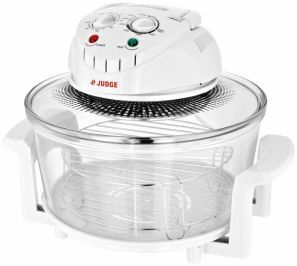 Judge Halogen Oven. The halogen powered oven circulates hot dry air giving you an even cooking environment. Its a versatile system allowing you to roast, bake, toast, grill, steam, reheat and defrost. Fast and economical with 3-5 times faster cooking and less than half the energy consumption of a conventional oven. Has a self cleaning mode and replacement bulbs are also available. 1200-1400w with a capacity of 12 litres. Recipe booklet included with ideas.